As business owners and managers, we all have lists of things to do. We may keep our lists on paper, on desktop sticky notes, or in our head. If we were pressured to do so, we could prioritize the list into three main categories: highly important with a close deadline, important but not urgent, and important but not actually important enough to really accomplish it. While all the items on the list are important (if you let an unimportant thing join your list take it off right now! ), how do you determine which things are “must do” and which things can wait? Go through your list of marketing activities and ask this question of each-is it negotiable? The danger comes when we let everything become negotiable because then we give ourselves permission to ignore it or move it to the bottom of the list. Is updating your mailing list negotiable? How about sending out the latest newsletter or sales flyer? Returning prospect calls or contact forms? Start small by choosing a few things that are non-negotiable. Perhaps it is sending handwritten thank you notes to new clients, updating your mailing list once a month, and sending out a monthly email. Once these few activities become non-negotiable, you will find a way to incorporate them into your allotted time and budget. There will not be that moment of indecision (do I have time to get this done?) because you view it differently now. 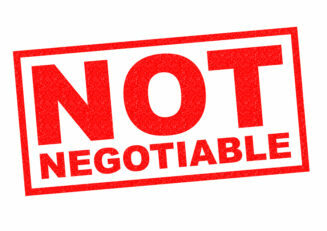 Now it’s NOT NEGOTIABLE! Think of the way you do this in your personal life. Perhaps picking up the kids from school, brushing your teeth before bed, and paying your bills every Friday are non-negotiable. You don’t have to make a decision, you just do it. Perhaps putting away the laundry the same day, calling your mother, or exercising are negotiable (no judgment here!). These things require a decision to be made in each circumstance- do I have time to do this now or do I want to do this now? Don’t fall into the trap of trying to make everything non-negotiable, that is unrealistic and sets you up for failure. By switching a few of your marketing activities to non-negotiable status month by month, you can successfully transition to getting more done, and we all know more marketing means more sales. If your list of non-negotiable things grows unwieldy, get help from outside. Remember, accomplishing the task is what is not negotiable, not who does it.